The Largest DDoS in History? 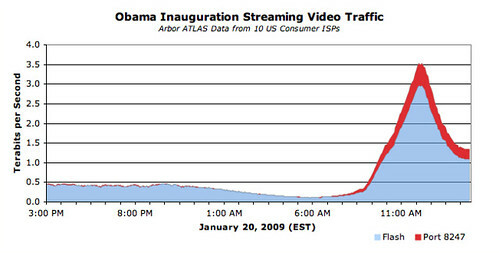 Streaming video traffic coverage of Obama's inauguration flooded North American backbones today. Traffic increases varied wildly across US providers with some seeing an overall 5% increase in backbone traffic and others jumping more than 40%. As a worker in information technology, I am lucky to be close enough to the wire to every now and then peek at the real world to see what is going on. With today being a fairly special day, I decided to stroll over to our networking group to peek at the traffic monitors, and I was greeted by nice solid green lines. This was the first time in my professional career that I was at the right place at the right time: our external bandwidth was pegged at 100% use, and would not move. Traffic peaking at 3.5 Tb/s is just simply unbelievable. 3.5 Tb/s is really a lot of data, flowing really fast. colleges and universities to meet the demands of a new age. All this we can do. And all this we will do." Puts the whole Heartland-debacle in its own perspective.